Why do some total knee arthroplasty (TKA) patients develop knee stiffness after surgery, and what can be done to manage it? But that’s just 1 factor of many possibilities, according to Raymond H. Kim, MD, who reviewed the etiology, diagnosis, and treatment of postoperative knee stiffness at the 6th Annual ICJR South Hip & Knee Course. Dr. Kim cautioned that results of these procedures are variable: ROM gains are possible, but they will be modest. The best management is prevention, he said, including adequate preoperative education and avoidance of technical errors. 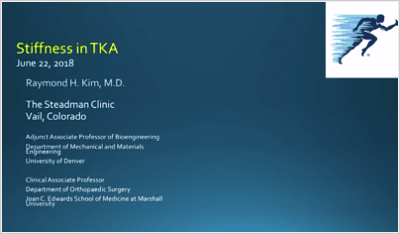 Click on the image above to hear more from Dr. Kim about knee stiffness after TKA. Dr. Kim has no disclosures relevant to this presentation. Springer BD, Odum SM, Nagpal VS. Is socioeconomic status a risk factor for stiffness after total knee arthroplasty? A multicenter case-control study. Orthop Clin North Am. 2012 Nov;43(5):e1-7. doi: 10.1016/j.ocl.2012.07.001. Next articleICJR REWIND: What Are the Top Considerations for the Table Used in a DAA THA?